Having made our traditional peppermint pralines last week, there was lots of the shredded coconut stuff left. This happens every year. I once found a bag of coconut I had first used three years before. Honestly! Then and there I vowed to find a recipe that would help me get rid of these leftovers. 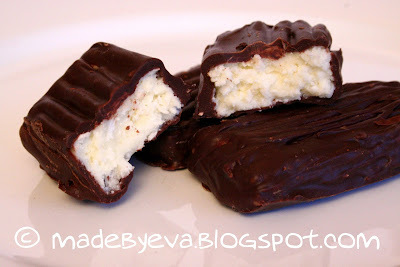 Last year I made some Bounty chocolates using this Cut Out + Keep recipe, but the amounts were totally off, and you'll see in the comments that many had the same opinion. Way too much butter, not enough powdered sugar. Luckily I had tasted as I went along (well, that's half the joy of baking, right??) and added what I needed to make them taste good. And trust me, they were very good. :P This year I thought I'd go about it a little more carefully and write up a better recipe. I measured and added ingredients until the texture and taste felt right and added it all up in the end. There are other variations out there, but most require double cream or condensed milk, and I like the simplicity of this recipe. Quick, before I say something too stupid: Let's get right down to the (huge) recipe! Mix together coconut, butter and powdered sugar well using a fork. This takes a bit of effort, and the mixture will seem way too dry at first. Keep working on it for a couple of minutes and it should suddenly come together to a firm, but sticky mass. Press toghether to form a sheet about a cm in thickness - I just do this by hand on a piece of parchment paper on my kitchen counter. Place in fridge for an hour or so, until completely firm. Cut into pieces of desired size - a sharp, hot knife will make this easy. Melt chocolate (temper if you like), cover coconut pieces. Place on plate covered with non-stick paper and let cool completely. Store in fridge.